Just a tad late in the game on this one. On December 7th, I received a press release regarding the legendary Scott "Wino" Weinrich, who will be putting out a solo album in March of 2011. He's also going to be touring with Scott Kelly of Neurosis, playing the opposite of Dylan and going "acoustic" for a split 7." More to look forward to for 2011. We don’t need to rave about the well-known legacy of the man who is Scott Weinrich, better known as Wino. With dozens of albums released throughout his time spent in The Obsessed, Saint Vitus, Shine, Spirit Caravan, The Hidden Hand, Shrinebuilder, Dave Grohl’s Probot project and much more since the late ’70s, his mammoth and varied resume spans nearly three full decades, essentially set him up as a purveyor and forerunner of the entire genre we now call doom rock. A true legend; this is Wino. But, with the release of the humble but legendary musician’s new solo album, Adrift, a side of the man that most haven’t heard is being uncovered for the first time. 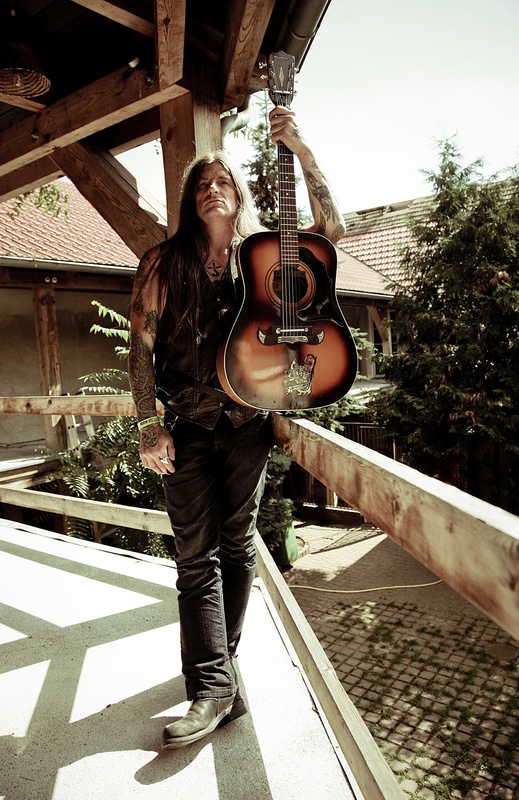 Answering the call from his friends and supporters to record an acoustic solo album following the sudden and tragic passing of friend and bandmate Jon Blank, who appeared on Wino’s first “solo release” Punctuated Equilibrium album in 2009, he set to work on his most personal and powerful recording to date. Adrift is a revealing alternative view of this underground legend’s personality and history. Stripped down to the bare minimum — just his voice and his guitar — the songs on Adrift follow classic American songwriting ideals offering a compelling mixture of emotion and storytelling. Wino is a man on his own in a boat without sails. He’s fighting against tides and storms, enjoying the moments of bright sunshine; bound to the will of something external — the wind, destiny and the drift. Easily his most heartfelt and personal material to be recorded to date, the twelve tracks on Adrift help elevate this already iconic musician to a new level of storytelling, setting Wino up to fall right in line with greats like Johnny Cash, Woodie Guthrie, Neil Young, Bob Dylan and other classic American songwriters. 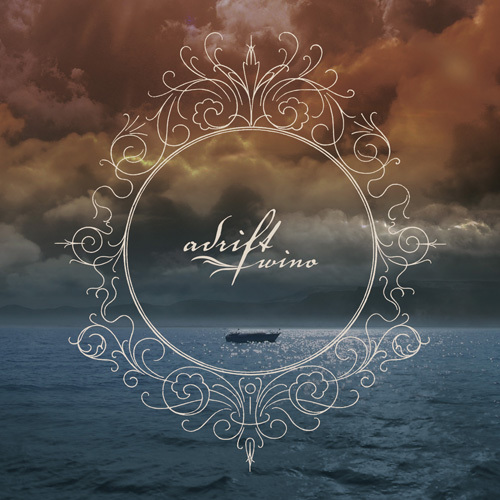 Adrift is set for official release on respected German label Exile On Mainstream Records March 8th, 2011 in North America, the label now distributed domestically by E1 Entertainment. A limited edition vinyl version of the album featuring extended liner notes and more is to be released in the U.S. on January 18th by Volcom Entertainment. Wino will hit the road stateside this February on a short acoustic tour, rocking alongside longtime friend, and also Shrinebuilder bandmate, Scott Kelly (Neurosis). 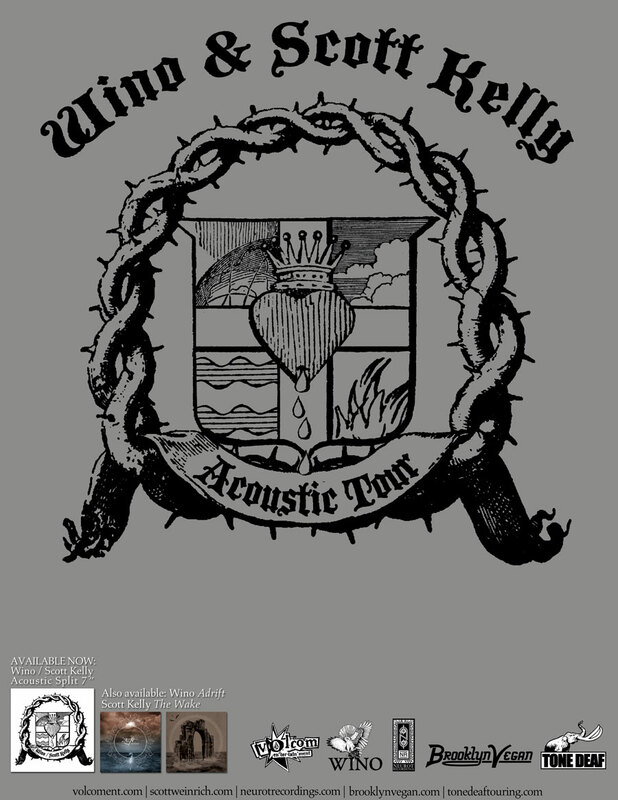 The tour will be in support of the upcoming split 7″ between Wino and Kelly, to be released early in the year by Volcom, as well as the Adrift album. Sponsored by BrooklynVegan, the tour will venture through California, Texas, Illinois, Massachusetts, Maryland and New York, showcasing both legendary artists each in solo, acoustic mode.